There is nothing like digging out the seeds and decorating the perfect pumpkin that you personally found deep in the patch and hauled it home. At the Kuipers Family Farm in Maple Park, Illinois, you can pick your own pumpkins in our expansive pumpkin patch. 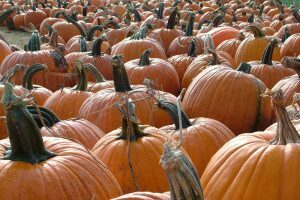 The Kuipers family opened their 71-acre pumpkin patch to the public in 1998 and families from all over have been enjoying the simple pleasures of a crisp autumn day on a spectacular and picturesque Midwest farm. Call 815-827-5200 for complete information on when and how you and your family can pick your own pumpkins when you spend the day at the Kuipers Family Farm. Fun is gown by the bushel at the Kuipers Family Farm. Create memories for your family to last a lifetime when you spend the day on our beautiful sprawling Midwest farm. Enjoy all of the fun, interesting, and educational feature, attractions, and rides. And of course, take your time scoping out the best spots for the biggest and best pumpkin picking in our expansive pumpkin patch. Then make it a point to come back in December to pick out your perfect Christmas tree.